Surfer escapes shark attack live on TV Jump to media player A professional surfer is attacked by a shark, live on television, during a competition. 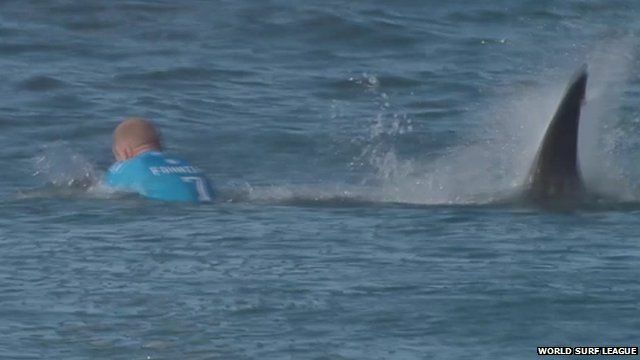 'I just wanted to save him' Jump to media player The mother of three-time world champion surfer Mick Fanning said it was "absolutely terrifying" watching her son being knocked off his board by an attacking shark. Stranded shark rescued from beach Jump to media player A great white shark has been rescued after it was stranded on shore. The man taking selfies with sharks Jump to media player Newsround chats to adventurer Aaron Gekoski who has taken selfies whilst swimming with sharks. How drones are helping hunt for sharks Jump to media player Lifeguards in the US have come up with a new tool to protect beach goers from potential shark attacks. How common are US shark attacks? Jump to media player Two teenagers have been badly injured in separate shark attacks at a popular seaside resort in the United States. Leopard shark gets underwater cuddle Jump to media player A worker in an aquarium on the Pacific island of New Caledonia has been filmed hugging a leopard shark while taking a break from cleaning the tank. Shark victim 'stitched up own leg' Jump to media player A doctor from New Zealand has managed to stitch up his own wound after he fought off a shark that had bitten his leg. A professional surfer has been attacked by a shark, live on television, during a competition. Australian Mick Fanning was taking part in the World Surf League event in Jeffreys Bay, South Africa, when the shark approached him from behind. Mr Fanning said he shielded himself with his surfboard and punched the shark in the back, prompting it to swim away. He was unhurt but the rest of the day's competition was cancelled.